One of the tools that let us know that we are doing things right is the emails and letters that we receive from our clients. These brighten our day, strengthen our commitment to bring you the best product and service possile, and confirm our decission of making this career choice. Hooray, Linda!. I run the risk of boring you with fan mail, but my new pen arrived this morning and I've filled it with Iroshizuku tsuki-yo Moonlight and it writes like a dream. No nib in my collection (100+ good pens) is as perfectly suited to my taste (and manipulative limitations) as your Daily-Italic 0.6mm. Thank you for your care and your craft. I received the nib today and when I inked it moments ago, I was blown away. I had to write you an email immediately to compliment your work. It is absolutely perfect. You will definitely be receiving more orders from me in the future. While the steel nib in the Bexley Prometheus was a very nice writer, your gold nib has transformed the pen!! A sheer delight. Thank you so very much! Linda: Wow! You have transformed the pen from quite useless to a new favorite. I am grateful and in awe of the arts at your command. I've loaded it with Waterman Mysterious Blue and have already written five pages to one of my granddaughters. It does precisely what you specified on the phone: glides with the lightest pressure and increases wetness--perfectly controlled--with slightly greater pressure. Thank you! I am thrilled beyond words with the beautiful repair work you did on my pens. Thank you so very much for your fine skills and craftsmanship! I am especially thankful and appreciative of the information you provided on both the pens. Not only did you advise me, in detail, of their condition upon your receiving them, but you also informed me of their likely history. I wasn’t sure who in my family had owned the pens, but, based on your information, I am making an educated guess! It would seem probable that my grandfather, who served in WWI, owned the older pen. And my father, who served at the end of WWII, owned the later one. And I’m also guessing that these pens were gifts to them after they left the service and began their professional careers. That’s my story, and I’m sticking to it! Thank you again for your wonderful work. I am very grateful to you! I can’t begin to thank y’all enough for the wonderful job y’all did on my pens. I am especially grateful for the incredible restoration of the old tired, banged-up Waterman 452. I am so excited I can’t see straight! The nib is wonderful. Being a lefty, I have always been a tad afraid to write with finer-point nibs. But I have been really working on applying much lighter pressure given the flex and finer point of this Waterman #2. And I am discovering a whole new dimension to my handwriting. I love the delicate line it lays down! Most of all, I simply love being able to use this old family heirloom. I have always wondered what stories it could tell. The repaired crack and replaced nib merely add to the mystique for me. And I have become very attached to this pen and will use it and cherish it -- all thanks to the both of you. Love it! Love it! Love it!!! The nib and the FLOW are absolutely perfect. Thank you SOOOOOOOO much. It’s hard to put this pen down now. Very cool! You recently repaired my red Waterman Carene fountain pen at the St. Louis Pen Show. I just have to tell you how happy I am with the work that you did. The nib no longer has ink creep and the writing is unbelievably smooth - better than when it was new. Thank you so much for your work. You're the greatist!! My Signum with the DailyItalic nib arrived about a month ago. I’ve been using it everyday since. It is everything I’d hope it would be. Thank you so much for your expert craftsmanship. Thank you very much for sending the Bexley Monarch Pen. I can’t believe how well it writes. I have purchased many fountain pens in the past and even the so-called premium brands can be scratchy and downright disappointing. Clearly your tuning does the job. I have just ordered another pen as I will be returning back home to Australia shortly and the postage will most likely become prohibitive. I got my Pelican 205 yesterday. Its a terrific writer and my new favorite. Thanks! Many thanks for the well-packaged, well-tuned, quickly-mailed Bexley pen. Your exceed the positive press about your services and skills. I'll be sure to come back for more. Look forward to test-driving my new hot-rod in Yurrup. Thanx so much for coming through in such a tight and busy time and for having the expertise to do this. I just wanted to say Thanks! for the Parker Striped Duofold (#7, Nov. Pentray) which I received from you last week. Absolutely Beautiful! The EF nib is a joy to write with, that should be an oxymoron but in this case it isn’t. I’ll be watching your site more often now. I wanted to let you know that the Parker 51 arrived today and it is simply beautiful. As requested, it is a wonderful and smooth and wet writer; and you were totally correct when you wrote in the description: “this will be one you reach for most”. This is definitely the Parker 51 I am reaching for! A wonderful and smooth writer! Pens arrived today--love them, thank you for doing such a great job! Thank you for fixing my sheaffer vac-fill pen. It is a pleasure to use. My wife was especially pleased when she found out her grand-father's pen had been restored to working order. Thank you again. Several months ago I sent you a Montblanc 642 (from the 50s). I never used the pen, because it is mostly a part of my vintage collection; however, I started to use it a few weeks ago, and, to my surprise, it is way better than I expected, amazing. I love it. This pen shows a perfect juicy flow and a very nice medium-stub line, with no skipping at all. The Rose Glow set arrived today, and I could not be more pleased. Normally, I do not prefer F nibs, but the ink flow on this one is just right for me and makes writing a pleasure. Thank you so much for making the adjustment I requested and for sending the set so promptly. It is all much appreciated. I just got my hands on the pen and gave it a go. When I put it on paper without filling it up, there were some clicking sounds in the nib. I was a little concerned. But with some ink in there, the clicking went away and it writes wonderfully!! The wetness, smoothness and the width of the italic is exactly as described. This was certainly worth the wait! The pens arrived yesterday, and they're PERFECT! Thank you so much for your work on this -- I really appreciate it. I am now pondering on which pens / nibs I should send you next and will let you know in due course. I just wanted to say thinks for my awesome Vanishing Point pen with the custom nib. You all were fast, easy, and exceed all my expectations. I had my original Vanishing Point stolen and was super bummed as it was a bit of a splurge purchase for myself. I had always wanted a custom nib so when I finally was able to replace my Vanishing Point, I was thrilled to find your website. I feel like the new pen is a huge upgrade, the nib is perfect, and it was here so fast. It is a bit silly to say but I feel a little smarter with a sharp, well crafted pen in my bag. I can't wait until I can afford another one and I will 100% be sure I purchase and send any recommendations through you all. Keep up the great work! I've used the Pilot VP with a 0.6mm DailyItalic I ordered from you for a couple of days now, and I just felt the need to compliment you on your work. I have a Pendleton Brown BLS, a Mark Bacas CSI, a Franklin Christoph SIG and a Masuyama stub. Your Daily Italic is by far my favorite of the bunch. It's wonderfully smooth, and still retains plenty of line variation. In fact, it has way more line variation than the Masuyama stub (as expected), but is also smoother. Thank you for your very kind words about my handwriting. I owe it all to people like you who take my absurd instructions and create instruments that are as much jewels as tools. Both pens are lovely writers (each quite distinctive, which is a quality of old pens that I love) and feature in my daily rotation. I received the package and want to thank you for the fantastic job done. I’m so happy, and will gladly recommend you. I was at the Chicago pen show. I had you work on my pen, a FM nib ground to a fine daily italic, and I love using the pen! You did a fantastic job and I wanted you to know how much I appreciate you! I just opened up the box. It was like Christmas! I just had to tell you that the Pelikan M200 with the 0.6 Italic nib is GREAT!! I LOVE it!!! You guys never disappoint! Thanks for cleaning out my pen -- it writes beautifully! So nicely packaged, too, and with the lovely handwritten note. It was worth the wait. 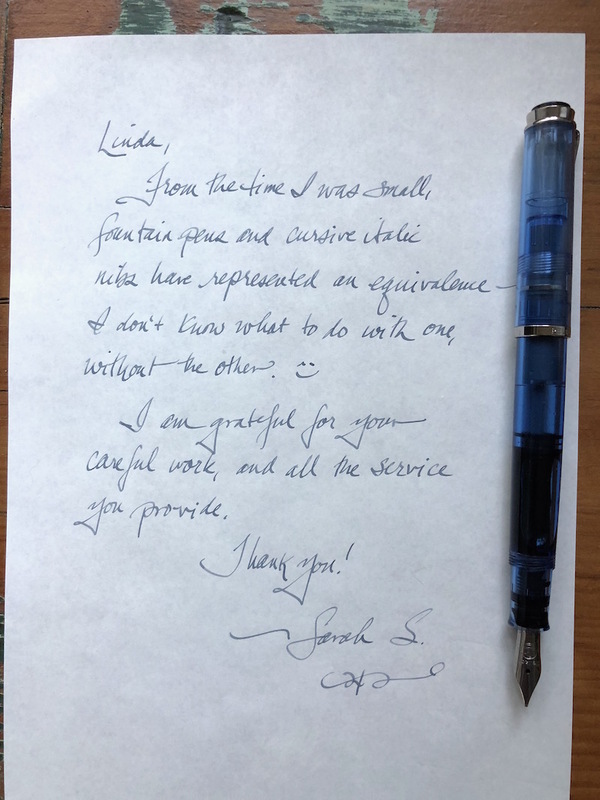 Just a quick note to express my gratitude for Linda's work on my new Daily Italic VP 0.6mm nib for my Pilot Vanishing Point. I am delighted with the precision of your work. It has added a new dimension to my writing. I am humbled to be in the company of true artisans. I just got back my Montblanc 146 yesterday and I'm completely amazed at how perfect the pen writes and how beautiful it looks. You both are certainly masters of your craft. I been grading students' papers all day, and using such a wonderful writing instrument has made the experience all the more enjoyable. Well done! Just wanted to let you know how happy a customer I am! Thanks so much, and I hope you both have a wonderful holiday season. I just purchased a limited edition 2016 Guilloche VP from you in EF. I could not be more pleased with this pen you guys did a fantastic job. After trying out many options I realized I wanted a fountain pen in EF because the majority of the writing I do is on regular paper and the feathering with the larger nibs is less than ideal. The first VP I bought was in EF and I could not stand how scratchy it was. So after buying a Lamy 2000, Esterbrooks, Parker 51s/21s all in EF I was disappointed and about to give up 100% on fountain pens. Until I met you guys at the pen convention. This 2016 VP I got from you in exactly what I have been looking for. Its super smooth doesn’t make a mess and just a really great daily user. I will be going back to you guys for all of my fountain pen needs. And I look forward to seeing you again at the 2017 pen convention. a big, ole thank you for sending this wonderful pen and I was astonished by your generosity. Not only did you include a bottle of Diamine Vermillion which I've been curious about for ages-- you included two ( TWO ) Rhodia notebooks ! I can't thank you enough. The pen and nib are a marvel. I will never demon flex the nib -- I'm practicing with a very gentle hand. 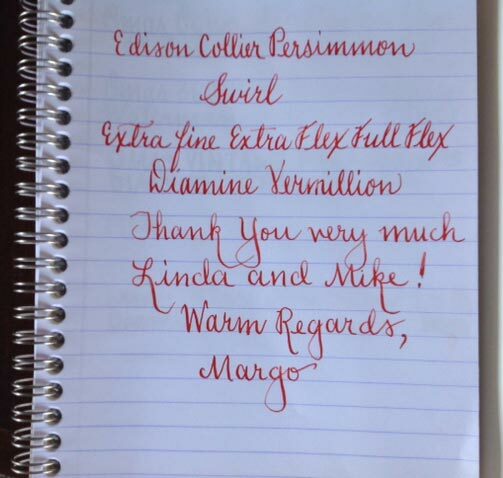 This Vermillion ink is a perfect compliment to the pen. Thank you again ! Wishing you a wonderful holiday season and you now have a loyal client in the Blue Ridge Mountains of Virginia. Thank you for this Pelikan fountain pen that I'm using as a daily writer. It writes wonderfully well and I appreciate tuning of the nib. The Pelikan's Extra Fine, I am told had issues in the past but this is a smooth writer with the right amount of wetness. Thank you so much! I have received my pen today together with a hand-written note describing the details of the repair. I really appreciate this extra bit of personal touch. My Mont-blanc worked as if it had been reborn. It was smooth with good ink flow. The hard starts and skipping issues had been ironed out. The repair was truly top-notch. Thank you so much. Thanks. Great job. Smoothest writing pen I have now. I received my pen yesterday and I cannot even begin to tell you how thrilled I am with the results. You are a magician and the pen looks brand new and I am using it already. I will certainly recommend your service to whoever needs a beautiful pen repaired. I also appreciated your professional packaging. I loved everything about the experience. I wanted to let you know that I received the pens yesterday, and had the opportunity to ink them today. Thank you so much, not just for excellent work you’ve done in restoring them, but for the obvious care you took in doing so. The included writing samples and notes on their condition are a testament to that. I really appreciate your efforts. It was worth the wait! Oh My Golly! I cannot believe how beautiful the old pens are!!!! I've never seen the color of the vacumatic before! Thank you so much! The lady writes beautifully too! Wish I could even remember what happened to her. She's lovely now. I search for words to thank you, but can't seem to find the right ones. [no pun intended]. All I could come up with was "Oh." when I unwrapped my husband's anniversary gift to me. And I'm am rarely speechless. It will give you a word picture to say that we both sat and cried! I am truly touched by your generosity, and want you to know you played a large part in a very memorable anniversary. I have used it for my journal entry for today. My Mother has been gone 5 years now, and memories of her and my Daddy are bitter-sweet still. I have her desk and the pen was still in the drawer although she had been too blind to use it for more than a decade. She used the pen to keep books for his business, in almost that exact color of ink, in the 1950s. It would have been less than ethical to do so in pencil! Somewhere is another pen that was a gift to her some time in the '30s but it has not turned up in her things. When it does, I can assure you it will come to you for restoration. You apparently run your business like my parents ran theirs - personally. It's nice to know there are still folks like you out there! The pen arrived in the mail this afternoon. Of course, I popped in an ink cartridge immediately and tried it out. I am currently studying Spanish, so I completed a translation exercise of 25 Imperfect Subjunctive sentences, English to Spanish, using the pen. It performed really well! It is the best fine nib pen that I have now. ¡Muchas gracias! Linda, just so you know that I really like and enjoy the Bexley "F" you so beautifully smoothed for me when I bought it at the show!! Many thanks for your good work! Pens arrived today. Very nice work, filled with no problems and they both write very well, love the ink too. Thank you so much, your work is greatly appreciated. Got the pens and they are NICE! Well done on the smoothing and flow adjustments. And the Rotring isn't bad at all, considering how messed up it was. Thanks again for taking care of them. Hi Linda, just got my pen today...Fantastic job, looks good and writes almost as good as new. The nib looks good and had its own "unique" shape that I other Visconti nib has, it's one of a kind 😉. thank you very much for working on my visconti HS - a visconti pen that actually writes... who knew??? Thank you for the wonderful repair work you performed on my Lamy 2000. Mail came in about the time it took me to ink the pens and try them out. The pen writes with such a wonderful softness. My hands are in pain and pushing on the other pens is just so hard. This writes with almost a thought. Thank you. I got the pen today and filled it with ink. It writes wonderfully, and it looks great! Thank you very much. I'm extremely happy with the repair; you certainly did an excellent job. I especially appreciate the time, labor, and expense you invested into it. I'm certain that you lost money on this repair with the low price you charged me for it. If using any part of this note will be of any benefit to you, please feel free to do so. Again, please accept my deepest thanks and appreciation. Great job Linda. It writes beautifully! I wrote letters with it this weekend. Very smooth and crisp. I got the Ingersoll back today. I'm tickled to death with it! It looks sharp, feels tight, and fills effortlessly! I'm quite taken with the nib. It's smallish for the size of the pen, but it writes and feels wonderful. The high quality of your work is in full evidence! I can't tell you how pleased I am. :) I will be more than happy to recommend you to anyone who needs their pen pampered and restored. Received my .7mm daily italic. Wow! Just what I was looking for to go on the LE Glenmont. Wonderful nib. I now have nibs done by Richard Bindler, Mike Masuyama, Pendleton Brown and yourself. This is easily in my top 3 nibs. Truly excellent. Thanks for the great work and best wishes to you and yours! I just got my VP DailyItalic .5mm nib in the mail and loaded it up with some Iro Chiku-rin. This is, without exaggeration, the nicest nib I have ever written with and I have tried many, many pens. Great work! So nice to have met both of you at the Chicago Pen Show. Thanks to Mike for the great job of fixing my leaking Waterman 52! Also, I really like the new Bexley I got from you at the show. Just wanted to email to say thanks for the Bexley - superb pen as always. The everyday italic, well, it's not so much that you can use it everyday it's more that you just want to - something I have been doing since I received it. Magic. Thanks so much for a superb pen and an amazing nib as well as for your help and advice - surely appreciated. With best wishes. I just wanted to let you know how pleased I am at the work you did on my two Sheaffers recently. The Craftsman in particular is just a joy to write with. I don't know which one of you (or both) does the nib work for your business, but I must take a moment to tell you that the fine point Pelican steel nib you tuned for me works especially well. I have been collecting (modestly) and using (extensively) fountain pens for over 50 years, and your preparation of this nib is excellent. Great flow, perfect wetness and wonderful glide on the paper. And, it is more like a fine point should be than most. I tend to end up using a lot of extra fines and extra-extra fines because the fines are too much like a medium except for the Vanishing Point fine. A fountain pen is only as good as its nib. 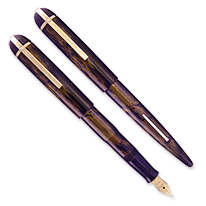 It is a big risk to buy a quality fountain pen or a replacement nib from a dealer that does not or cannot make sure the nib is right for writing. Thanks for a great job on this one. It got here quickly also. I am glad you are out there! I got the New Postal Reservoir today. Perfect! I am so pleased with this pen. Thank you for the extra bit of magic, and for sharing a considerable bit of knowledge about fountain pens with me. The notes back and forth look like lab notes from a quantum physics lab. I hope it wasn’t too much trouble. And the New Postal has created an entirely new role for a pen – my handwritten notes on Clairefontaine. Yes, that’s right, Linda. The DailyItalic is the first nib I’ve ever owned that makes it enough of a pleasure writing on good paper to actually do that for work. No southpaw smear. I received my PFM II back from you yesterday and I am astonished! Your skilled attention has restored it to a far better condition than I'd dared to hope. Just want to thank you again for the *wonderful* job you did on my Pelikan M200 Classic and nib. The DailyItalic is just perfect on the 14k Pelikan F nib. Though (of course) it doesn't spring quite like the vintage nibs, it makes the nib more than usable. Honestly, I can't imagine wanting any other nib now. And smooth, and wet (but not too wet!). So thank you again! September is my birthday month, and this is going to be one of the best (if not the best) "gift" I receive this month. (Let's just say I'm in my late 50s!). 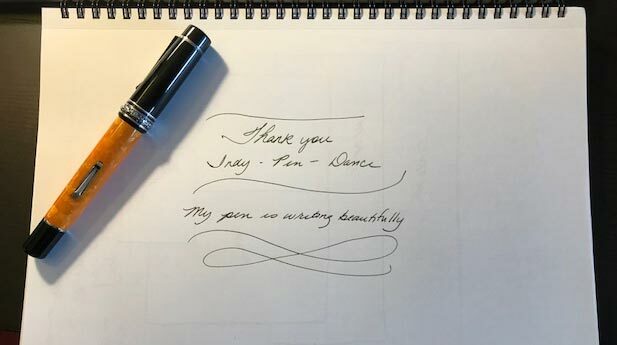 Thank you – the pen writes wonderfully! I just wanted to let you know what a great job you did on the custom grind Edison Nib, that I purchased from you recently. It's exactly what I was looking for. I'll be sending more work your way - I'm a very happy customer! Just thought I'd let you know that the nib is AMAZING. I have long hesitated getting an EF but getting it through you was the way to go. The nib you sent me is perfect! It works just like I want it to. Thanks so much for your help and for doing such a great job. I'll be in touch in the future. This is my second "Love letter" to you. Many more to follow, I hope! was very professional and much appreciated. This was my first time ordering from your company, (as I am new to fountain pens) but I will most certainly order from you again if I can. Thank you very much! My nib has arrived and it is an absolute pleasure to write with. I have had a (original) nib in my Vanishing Point before but that is a completely different experience. And even my beloved Rotring 600s might be getting little use in the next few weeks. This is my first adjusted and smoothed nib and it is definitely noticeable. Again thanks so much and all the best for 2016! I finally got around to installing the EF unit that I ordered from you. My Decimo is now twice the pen it was and I am happy that I can use it more frequently. 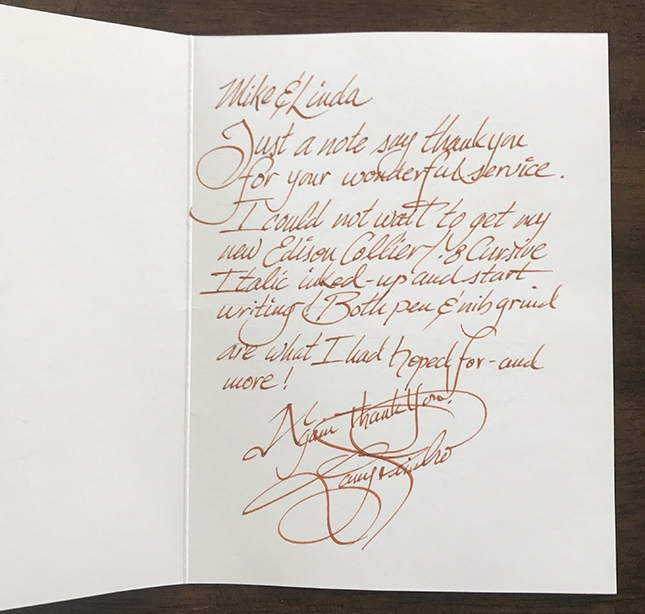 The card says Linda tuned the nib and I owe her my thanks. Feel and flow are perfect! I received the pens today, and they look fantastic! I'm very impressed with what you did with the gold ringtop; it looks gorgeous and it's a great writer. Great job on the five pens. I am very happy with the work and the notes written with the pens. They were my mother's and father's pens. Never got around to sending them in for work. Linda: THANK YOU! Received the pens yesterday and they are great. As gran'pa used to say, " I am happy as a dead pig in the sunshine." They are so good, and your "sampler" is a wonderful idea, though my handwriting will never be a good as yours; as a matter of fact, it never has been. Thank you, again, I am just delighted with them - I want to start writing everyone I know with my "new" pens. Received the fountain pen I ordered from you, and it writes like a dream. I am a very happy customer! I just got my Pelikan M1000 back after y’all turned it into a true XF and smoothed it. Very Nice! It writes extremely smoothly, and the M1000 has just that touch of “bounce” to the nib. Thank you. Oh My Golly! I cannot believe how beautiful the old pens are!!!! I've never seen the color of the vacumatic before! Thank you so much! The lady writes beautifully too! Wish I could even remember what happened to her. It she's lovely now.